For the majority of the crew this would be their fourth sortie together. As Halifax VR-T headed to Hamburg one change had taken place. Sgt. 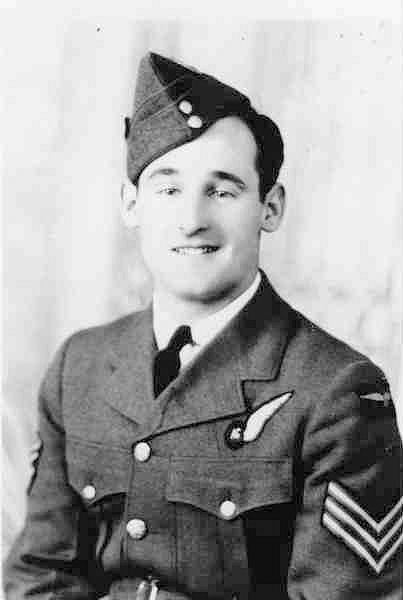 J.J. MacCormick the rear gunner was not flying with them, in his place was F/S Daniel McCarty. McCaty was normally in the Mid-Upper turret and to take his place on this operation was Sgt. John Sadeski flying his first operation. Sadeski was member of Sgt.D.T. Cook's crew. Sgt. 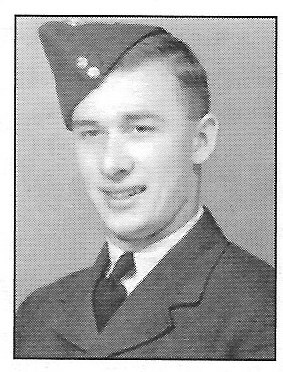 Farrow the wireless operator, provided the details of the events of that last operation for the Sobin crew. Sgt. Sobin had reported lightening ahead, to him it appeared to be below the Halifax and no course or altitude change was made. As they neared the last turning point before the target, about 3 to 4 minutes out of T/A, Sobin was heard to remark that he was about to fly through cumulus-nimbus clouds and that the aircraft was already beginning to ice up. The Navigator, P/O Sibalis informed his captain that they were only one minute from the target and requested him to stay on course and maintain the present altitude. Sobin replied that he intended to jettison the bombload and turn out of the cloud. Within a fraction of a second of saying that the Halifax banked sharply with all engines dead, a blinding flash then disabled all the electrical circuits and the radio had exploded. Farrow believes that they had a direct hit by lightening as he stated that there was not any flak at the time of the flash. The Halifax began falling in a steep dive, Farrow was unable to move until Sobin managed to regain control at 5,000 feet. Sgt. Farrow then began to crawl forward to the cockpit where he observed there was a large hole on the starboard side. Two the crew Sgt. Mahoney and Sgt. Sibalis had already bailed out of the aircraft. Sorbin signalled Farrow to do like wise. As Farrow crawled back to pick up his chute he believed he saw Sobin preparing to bail out. By the time Farrow jumped from the rear door the Halifax was at around 600 feet. Sgt. Farrow had a hard landing as the parachute had not fully employed before he hit the ground. Luckily for him it was soft boggy soil and he sustained no injuries. There is no explanation why the others including Sobin did not jump from the stricken aircraft. Sgt. Mahoney had injuries which required him to be hospitalized. Where the injuries occurred, before, after or during the jump are not mentioned. 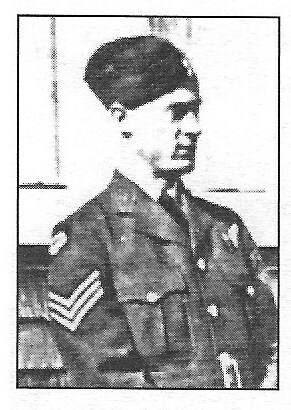 In February of 1945 he was repatriated. Sgt. Farrow and P/O Sibalis became PoWs. Although some sources mention that the crew flew more operations than the four I mention, the squadron ORB shows F/S Sobin completed his second 2nd. Pilot sortie on July 24/25th. The squadron did fly one operation on July 25/26th but the Sobin crew were not on the Battle Order for that sotie. Their operations were carried out on the nights of July 27/28, July 29/30, July 30/31 and August 2/3.